The obvious place for me to start – as a Packers fan – is with Green Bay’s 33-28 win in Chicago last Sunday, that clinched the NFC North for the Wisconsin team with an 8-7-1 record. 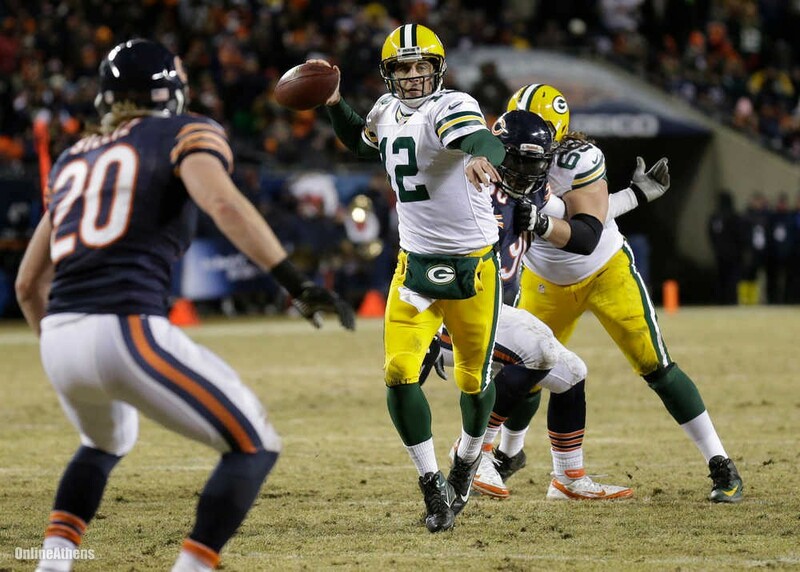 It was the first game back for quarterback Aaron Rodgers, who had been out with a broken collarbone sustained in their first meeting with the Bears on November 4th and although there was some rust – he had a rare multiple interception game, giving up the ball on both of the Packers first two possessions – he came through big on the final drive to send Green Bay into the playoffs. On three occasions in that possession, the Packers faced fourth down with the season on the line: first time, John Kuhn picked up the needed yard; then on another 4th and 1, Rodgers found his favorite target of the day, Jordy Nelson; and finally, with a 4th and 8 on the 48 yard line, Randall Cobb streaked for the end zone, was not picked up by the Chicago defense who were expecting a shorter pass, and number 12 did not miss as he put it right into Cobb’s hands for a touchdown that gave Green Bay their third consecutive division title and fourth straight playoff appearance. For the third season in a row, the Cowboys lost a week 17 contest against a divisional opponent that saw them eliminated from the playoffs, this time being beaten by the Eagles 24-22, after falling to the Giants in 2011 and Washington in 2012. This year they were without Tony Romo, who was ruled out with a back injury, but the replacement quarterback, Kyle Orton, had an opportunity to win the game at the end after leading a touchdown drive in the fourth quarter that would have tied the game but for a failed two point conversion. After that, the Cowboys defense forced a three and out on the Eagles and got the ball back, but on the first play of their final possession,which started inside the two-minute warning, Orton threw an interception to effectively end the game and send the internet into a frenzy of people wondering if the backup was actually just Romo – known for those sorts of mistakes at the end of big games – wearing a different jersey. The victory for Philadelphia means that they will be the third seed in the NFC and this weekend they will be hosting the Saints, who clinched their place in the playoffs by defeating the Buccaneers 42-17 in New Orleans, giving them a perfect 8-0 home record for the season. Carolina’s earlier 21-20 win in Atlanta had confirmed the NFC South title for the Panthers and consigned the Saints to a Wild Card, which ended up being as the six seed, since the Cardinals came up short against the 49ers, despite coming back to tie the game at 20 after they had trailed 17-0 in the first quarter. With the final play of the game, a Phil Dawson field goal gave San Francisco a 23-20 victory and the fifth seed in the NFC, something they had to settle for as the Seahawks locked up the NFC West and first seed with a 27-9 win over the Rams in Seattle. There were still four teams in with a chance of claiming the sixth seed in the AFC heading into Week 17, though the Steelers were in the weakest position as they needed to win their game and hope that all of the other three lost theirs. Pittsburgh took care of what they could control – beating the Browns 20-7 at Heinz Field – and the other two early games also went their way as the Dolphins were defeated at home by the Jets, while the reigning Super Bowl champions, the Ravens, lost in Cincinnati to end their hopes of defending the title. Things still looked bleak for the Steelers however, as the other team they needed to lose, the Chargers, were facing a Chiefs side who were locked into the five seed and were thus taking the opportunity to rest many of their starters with the playoffs their primary focus. Nevertheless, Kansas City’s backups played well and held the lead for much of the contest, then had the opportunity to win it with a field goal in the final minute. That chance was missed by Ryan Succop – though San Diego should have been penalized on the play for having seven defenders on one side of the ball, which would have given the Chiefs another chance from 36 yards – and the Chargers won the game and the AFC’s sixth seed with a 27-24 overtime victory. Elsewhere, New England clinched the 2 seed with a 34-20 success over the Bills, while the Broncos earned home-field advantage in the AFC with a 34-14 defeat of the Raiders, a contest that saw Peyton Manning add four more touchdowns to his single season record and also broke Drew Brees two-year old mark for most passing yards in a campaign. The Texans will have the number 1 pick in the draft as they finished with the worst record following a 16-10 loss in Tennessee, while Washington’s 20-6 defeat against the Giants means that their pick, which they sent to the Rams as part of the Robert Griffin III trade, will be number 2 next May. The other games saw Minnesota edge Detroit 14-13, with both teams then firing their coaches on Black Monday – a day that also saw Cleveland, Tampa Bay and Washington get rid of their head coaches after disappointing season – and the Colts continued their improvement over the last month with a 30-10 victory over the Jaguars. The other thing that happened in week 17 was that in my picks against the spread, I went 13-3 on the week to end the regular season with a 132-124 record, finishing above .500 for the third season out of three that I have been doing this. That being said, my record in the playoffs – save for my pre-season pick of the Ravens winning the Super Bowl in 2012 – has not been so good, so take these selections with a pinch of salt.